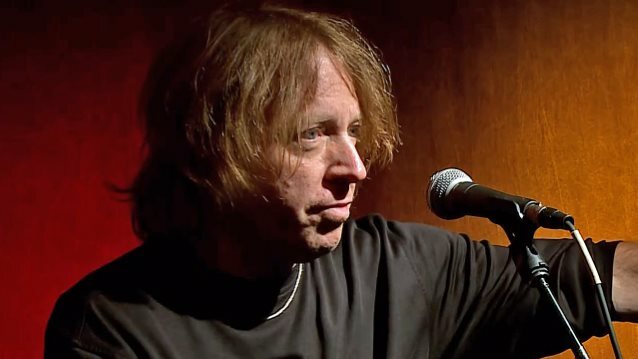 Former DIO bassist Jeff Pilson believes that Ronnie James Dio "would have approved" of the legendary singer's hologram, which made its debut at last year's Wacken Open Air festival in Germany. Created by Eyellusion, the surprise appearance of the heavy metal icon during DIO DISCIPLES' set closed out the massive metal event which was attended by more than seventy-five thousand fans. Eyellusion recently announced initial dates for "Dio Returns: The World Tour", featuring the Ronnie James Dio hologram reunited with the late rock star's former bandmates from the DIO band. The tour will make more than eighty stops around the globe, kicking off in Helsinki, Finland on November 30. Asked by the "Music Mania" podcast for his opinion on the Dio hologram, Pilson — who was a member of DIO from 1993 to 1997 and again from 2004 to 2005 — said (hear audio below): "I haven't actually seen it in person, but I've seen some pretty interesting pictures and I saw a video for a moment, and it actually looked really cool to me. I thought they did a great job on it. Again, I haven't seen it in person, but from what I've seen, it looks pretty amazing." He continued: "Ronnie loved technology, and I think, deep down, he would have loved the thought that that could have happened. And knowing him, 'cause he was quite an imaginative guy, he probably did imagine that something like that could happen. And honestly, I think Ronnie would have approved." The "Dio Returns" tour will also make stops throughout Argentina, Australia, Brazil, Chile, Colombia, Ecuador, France, Germany, Japan, Mexico, New Zealand, Paraguay, United Kingdom, Venezuela and other countries, with dates to be announced. The trek is expected to come to the United States in spring 2018 and play festivals globally during the summer. The Ronnie James Dio hologram will perform for the majority of the show, treating fans to an alternating set list that will feature songs such as "Holy Diver", "Rainbow In The Dark", "We Rock", "King Of Rock And Roll", BLACK SABBATH's "Neon Knights" and "Heaven And Hell" and RAINBOW's "Man On The Silver Mountain" and more. The "Dio Returns" tour will feature Dio's actual live vocals, backed by a live band consisting of former DIO and current DIO DISCIPLES members Simon Wright (drums), Craig Goldy (guitar) and Scott Warren (keyboards) alongside bassist Bjorn Englen (YNGWIE MALMSTEEN). Veteran metal vocalist Tim "Ripper" Owens (JUDAS PRIEST, ICED EARTH, YNGWIE MALMSTEEN) will also perform, with singer Oni Logan (LYNCH MOB) also joining on select dates.